From The North - via M5 (Worcester)Leave the M5 at J7, take the 3rd exit at the roundabout for A44 Worcester. At the next roundabout take the first exit for A4440 then follow road through three more roundabouts before following A4103 to Hereford for 26 miles. On the edge of city is a roundabout. Take second exit following A4103, then left at next roundabout for A49. follow road to go straight on through first roundabout, then right at the second. Ground is on the left, turn left at far end of ground (Blackfriars Street) for parking. From The North - via A49 (Shrewsbury)On the A49 follow signs for Hereford. At roundabout on the outskirts of the city, go straight on to follow A49. Follow road to go straight on through first roundabout, then right at the second. Ground is on the left, turn left at far end of ground (Blackfriars Street) for parking. From the South & LondonTake the M40 to Oxford then follow signs to Gloucester (A40). Continue along the A40 to Ross-on-Wye, then take A49 (Signposted Hereford). Once in city follow signs for City Centre, and take the second lane. Just past the Steels car dealership the lane forks. Continue straight rather than bearing right. The ground is on the right hand side, take the feeder lane before the ground (Blackfriars Street) for parking. From the South West Take the M5 until J18a for the M49. Take the M4 at J22 and depart at J24 following A449. Take the Monmouth (A40) road and follow through first roundabout. Take the A4137 then join the A49 and follow the signs for Hereford. Once in city follow signs for City Centre, and take the second lane. Just past the Steels car dealership the lane forks. Continue straight rather than bearing right. The ground is on the right hand side, take the feeder lane before the ground (Blackfriars Street) for parking. By Train Hereford railway station is served hourly by trains from Birmingham, Manchester, Shrewsbury and Cardiff Central, two-hourly from North Wales, and less frequently to Oxford, Reading and London. 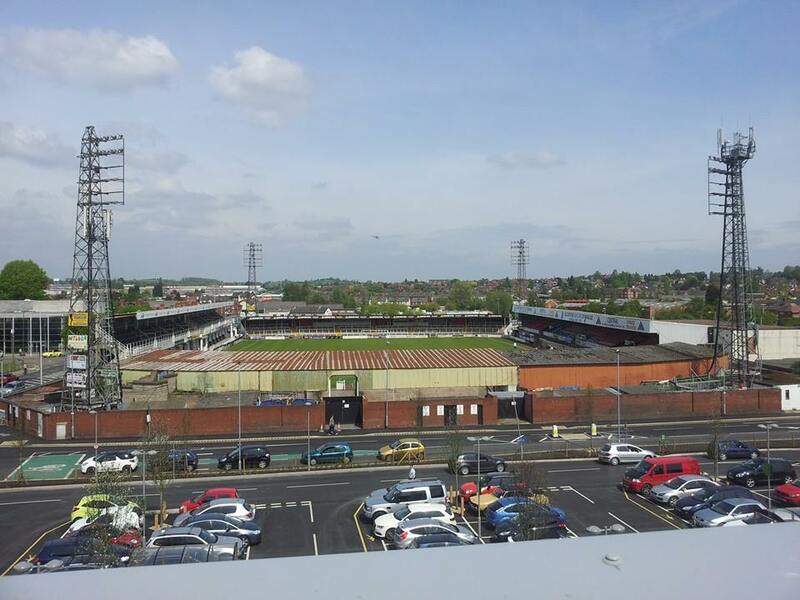 Edgar Street is a 15-minute walk from the station, walk down the City Link Road to your right and after crossing over Widemarsh Street you will see the ground on your left. There is a car park right next to the ground which costs £1 an hour, up to £5 for all day Monday - Saturday (cheaper tariff on Sunday), or £1.50 after 6pm. Alternative parking can be found at Garrick multi-storey park at the far end of Blackfriars Street, the Old Market shopping complex as well as a number of other council car parks a short walk away. Home fans are housed in the Meadow End Terrace, the Merton Stand, and half the Len Weston Stand. Away fans are housed in the other half of the Len Weston Stand. Tickets can be bought online or from the club shop. Edgar Street operates cashless turnstiles, with the exception of two gates on the Meadow End - tickets on the day can be bought from the match day ticket office on the corner of the Meadow End and Merton Stand. Being near the city centre there is a plethora of pubs and food outlets near the ground. Commercial Road (map) has a KFC, McDonalds, Subway, and several other chip shops and takeaways. It also has a Wetherspoons and other pubs. Real ale fans should check out the Barrels (St Owens Street) or the slightly further Victory (Ledbury Road), while Beer In Hand (Eign St) has a wide range of beers and ciders from small producers. Nearest pubs to the ground are the Heart of Oak at the north end of Edgar Street and the Oxford Arms and Herdsman on Widemarsh Street. The club itself provides basic food within the ground from kiosks. There is also a decent chip shop near to the Widemarsh Street exit of the Merton Meadow car park and several takeaways on Widemarsh Street (evenings only). Radfords bar, situated in the Merton Stand, generally accepts both home and away fans. The Starlite Room suite has Addisons Bar which is open to home fans before and after games and also accommodates smaller away followings.